Horizon Indoor Bike GR7 - inspired from the racing cycles of professional riders! Optional LCD console with various training programs and real-time feedback. 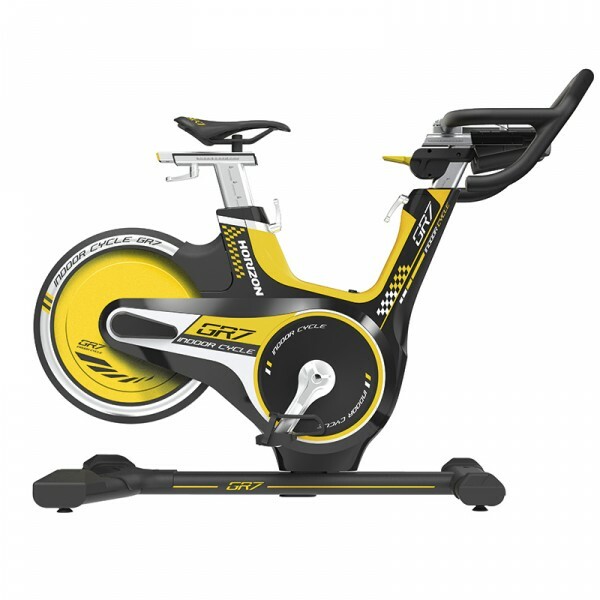 The GR7 Indoor Bike is ideally suited for anyone that wants to train inside using a racing cycle. Experience an almost silent and frictionless training thanks to it's magnetic resistance system. Enjoy by every training session the ergonomic racing saddle and the finely adjustable multi-position handlebar. 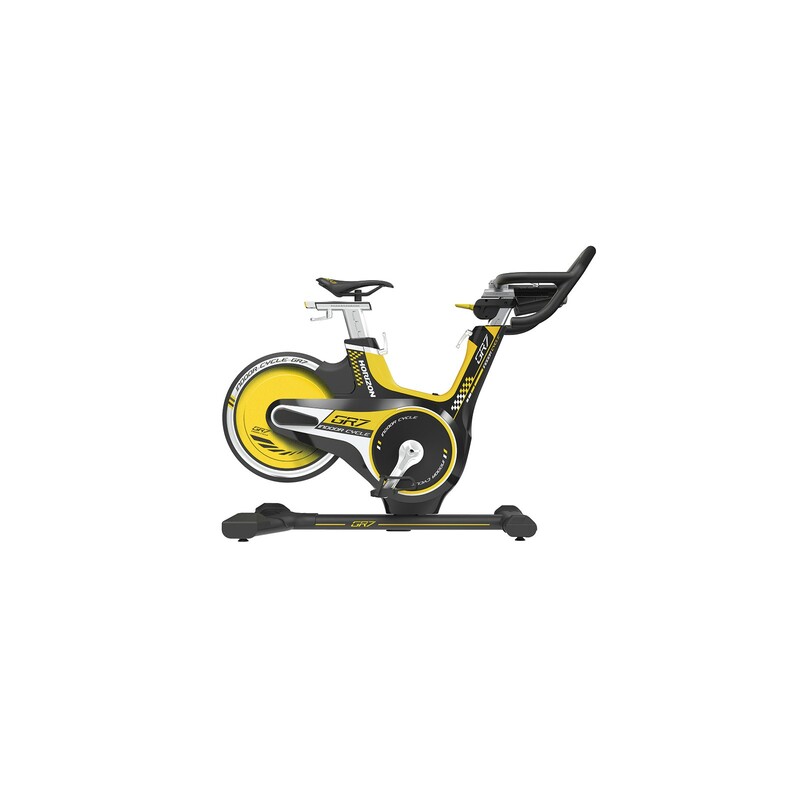 The stylish Indoor Cycle lets you easily and quickly change the seat position to suit every body type. The freely available fitDisplay App connects your Smartphone or Tablet via Bluetooth with your Indoor Cycle and offers entertainment, motivation, tracking your training and more. Ride through real landscapes throughout the whole world with Virtual Active. Competitions as well as challenge programs open up a new social network where you can also earn bonus points. There is also a range of goal baised training programs in fitDisplay that save your personal settings and training data to give you an optimal evalution of your improvements and successes. Open up a captivating training world with the free to download fitDisplay App in the AppStore or Google Play. The optionally available LCD-console gives you real-time feedback in your training so that you always have the important data in front of you. The innovative "Glow Ride" light system takes your interval training to a new level. The LED-light leads you through the different phases of a route with the associated training position. Das GR7 ist nicht nur optisch ok sondern auch funktionell.Der einzige Schwachpunkt ist die App, die von Anfängern produziert wurde.Die Datenspeicherung ist nur teilweise möglich, muss bei jedem Neustart mein Körpergewicht neu eingeben - mühsam ! Aber mann kann auch ohne App gut trainieren. Tolles Indoor Cycle - gute Verarbeitung, sehr gute Funktion. Das Bike lässt sich optimal einstellen. In Verbindung mit der Fit Display App lassen sich sehr gute und abwechslungsreiche Trainingseinheiten absolvieren. Sehr gutes Indoor-Cycle besonders in der Kombination mit der App. Sieht auch noch sehr schick aus! Horizon Indoor Bike GR6 In stock! Horizon Indoor Bike GR7 add to comparison list.